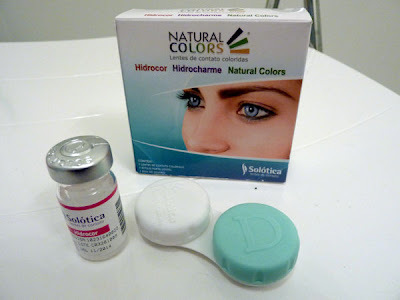 Solotica produces three types of colored contacts, namely Hidrocor, Hidrocharme and Natural Colors. 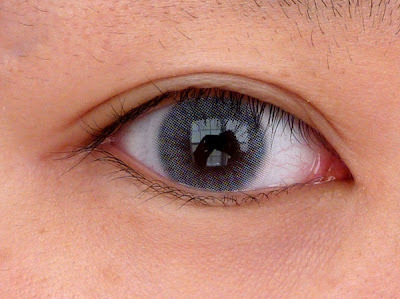 Hidrocors are the most opaque among the three, and does not have a dark limbal ring, while the other two has the ring. I have very dark brown, almost black eyes (see below) so I decided to get Hidrocors to get the lightest color possible. When I first looked into the vials I was like "What is that white stuff floating around, is it mold?" Then I realized that that is the contact! Here is the lens on my finger and palm, where you can see it a bit better. The color does not go all the way to the edge of the lens (since these are not circle lenses) and has a distinct pixel-y design. As you can tell especially from the direct sunlight photo, these contacts looks very natural from a distance, and blends very well with my natural dark brown eyes. In fact, they are so natural I think they are a bit boring looking! Also, I don't know if you noticed, but the lens in my left eye (your right) is slightly more pigmented than the right. It is not extremely obvious at conversational distance, but it bugs me just a little bit. Here are a few closeups on one eye. The pixelation is very obvious at that close a distance. 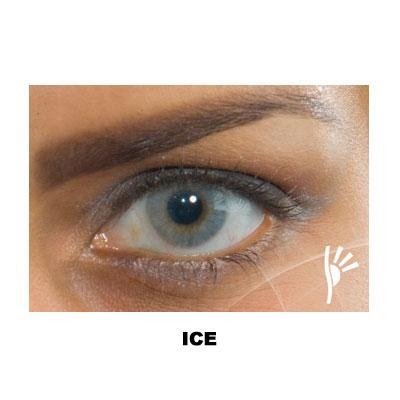 The Hidrocors are completely non-enlarging, and the extremely light color of the Ice lenses almost has a negative enlarging effect on my eyes. Some people might be turned off from the lenses by this factor, but since I bought these lenses to wear with heavy gothic-style makeup, I think this will actually work to my advantage by providing intense contrast. Design: 9/10 - The white color freaked me out initially, but they look very natural once I put them on. Some people may find these contacts kind of boring to look at though, but they are supposed to look natural so I like them quite a lot. 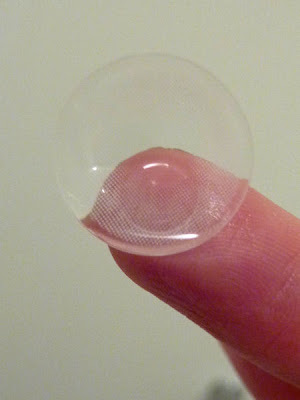 Comfort: 7/10 - They are obviously thicker than my EOS lenses, but they are not outright uncomfortable. I will have to wear them out for a day (or night) to see how quick they become dry or irritating, but for the 15-ish minutes I wore them for the photos they are fine. TOTAL: 8/10 - I am scoring these by themselves (natural colored contacts), and not comparing them with my circle lenses. These lenses are not for those looking for the dolly-eyed look, but if you want very natural color and design these are the lenses for you. I can totally pretend to be Sayuri (from Memoirs of a Geisha) with these! I agree I think they look VERY natural I love it ! Can you tell me where you bought this? Cassie: I bought them at Viallure (http://www.viallure.com.br/), they were about $100 including shipping. WOw. They are white o.O And for some reason they look incredibly natural!!! OMG. What is the price of these? Tamara: They are about US$100 including shipping, depending on where you bought them. i think mika nakashima uses these! your eyes look like hers, and your eyebrows & skin too! Would you update on the comfort factor after wearing it for a long period? My eyes are extremely sensitive and dry in the winter, I would hate to pay so much for something I can't wear! 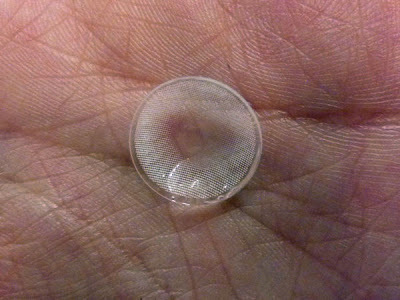 Lyricus Ray: These contacts are a little bit thicker than circle lenses but not particular drying, but if you are concerned it is better not to buy them. 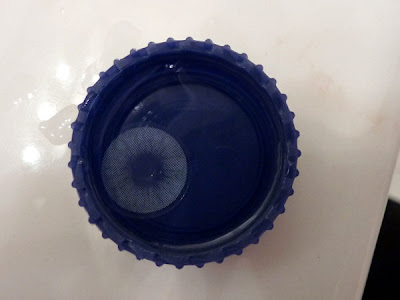 Do you know any circle lenses that are this color? 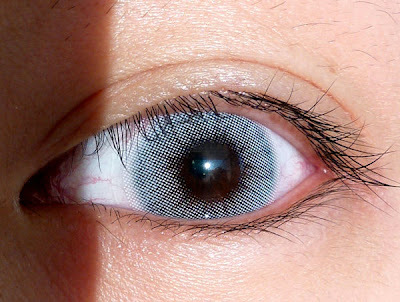 These look so natural, but I want the enlarging effect that circles lenses bring. Zoe: Not any that I am aware of...If I know, I will definitely buy them and review them! Hope you respond since you reviewed this so long ago. My iris is pretty small. I'm hoping to get hidrocor ices since it's white and I won't get that bleeding effect. I would much rather get the hidrocharmes though but I don't know how opaque it would be. Sigh, my eyes are the darkest brown ever too. Should I go for hidrocharme or ice in your opinion. My goal is to not look weird but still get a really light color. 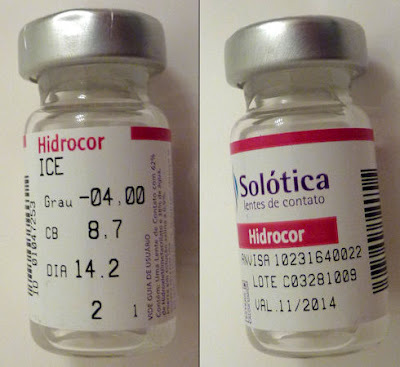 kellyisjb: If you are afraid of bleeding effect (also called halos) you should definitely stick to Hidrocor. 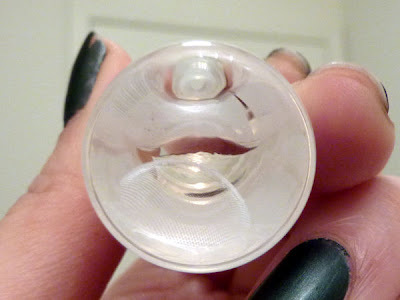 Hidrocharme has a dark outer ring, which will make the halo very obvious if you have dark dark eyes like mine IMO. Greetings! I´m dropping a message cuz I liked what I read here! Thanks Piggy! Your review and pics were the best and most realistic I could find. 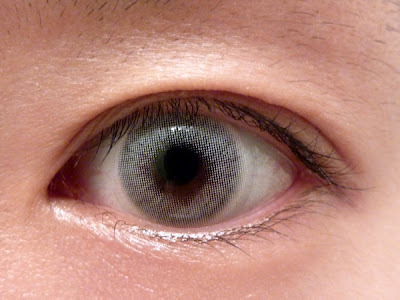 I'm ordering these same lenses from Viallure.com.br. 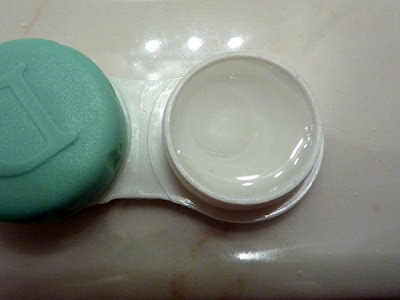 How long can you wear the one pair of contacts? JD: I wore them for a whole night of concert-attending, but it is recommended that you don't wear color contacts for more than 6-8 hours at a time. The contacts themselves lasts a year.